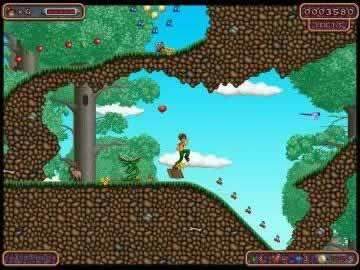 Bud Redhead Game - Download and Play Free Version! Travel through time with Bud Redhead searching for his abducted girlfriend Rachel! Bud and his girlfriend Rachel are going for a nice walk in the park. A furry green creature appears out of nowhere in a flash of light; he disappears with Rachel, leaving Bud alone. Bud is desperate to find Rachel and is willing to do whatever it takes to get her back. He will go 8,000 years in the past or even travel to millions of years to the future! Your quest to find Rachel will lead you to 4 different places in space-time continuum: from the forest more than 8000 years ago, over Ancient Egypt and Medieval Castles, to a Space Ship orbiting Saturn a couple of million years in the future. At the end there is a fun Big Boss level in shoot'em up style. 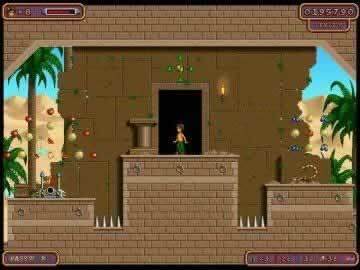 Using interesting hand drawn graphics, you will find an array enemies, thousands of gold coins and jewels, moving platforms, ladders, and there are also many secret areas in each level. Be careful of the slippery surfaces and enemies so you don't find yourself quickly landing on hard times!